I have many sensitive documentation which I am scared to lose or get somebody accessed. My question would be what is the ultimate encryption protection? I have read lot of articles saying that for instance bitlocker is prone to cracking or reverse brute force password hacking. I am a little paranoic using 24 alfanumeric character password but still scared if reading articles as bellow saying there is tool to crack bitclocker protection. There is unfortunately no "ultimate encryption tool". However there are some tools, that if used correctly provide reasonable security. These tools listed here are well known to provide strong enough encryption to resist currently known attacks, if used correctly. Not all tools listed here are usable for everything (e.g. you can't encrypt a partition with GPG). Depending on what kind of sensitive documents you need to store, you might want to take a look at Qubes OS. 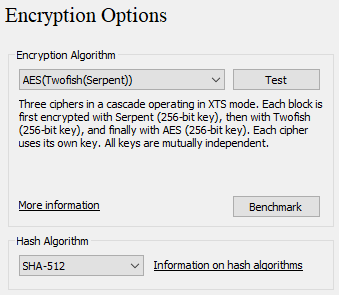 Don´t exists a "ultimate encryption tool" but with right tools e a little discipline is possible protect your files with a good encryption cipher and software, my recommendation is Veracrypt with AES-Twofish-Serpent cascade cipher and SHA-512 Hash cipher, if your have some problem with SHA-512 you can use Whirlpool cipher instead, a community developed cipher with 512 bits like SHA-512. On Windows systems veracrypt also used for encryption hard disk offering a more trusted protection than Bitlocker using a AES-256 cipher. On Linux/BSD systems LUKS disk encryption and GELi is best default options available instead Veracrypt or others softwares. You can also use PGP with a key-pair RSA-4096 for encrypt text / email and even files. Check this: Obs *Onion Hidden Services required Tor Browser. Finally... Your protection depends largely on your enemy and the amount of resources that they have, for common people combination of this softwares and good practices that's enough. I do know LUKS on Linux partition and frequently using but I have also windows desktop. I also know Veracrypt but I have red article saying that also Veracrypt is prone to cracking or brute force attacks.https://blog.elcomsoft.com/2016/07/breaking-bitlocker-encryption-brute-forcing-the-backdoor-part-ii/ Also bitlocker is not 100% safe. No good reference about those tools saying how secure it shall be? Not the answer you're looking for? Browse other questions tagged anonymity security windows browsers encryption or ask your own question.